In 2016, MLive reported that 26 percent of Michigan students are enrolled outside of their home school district. 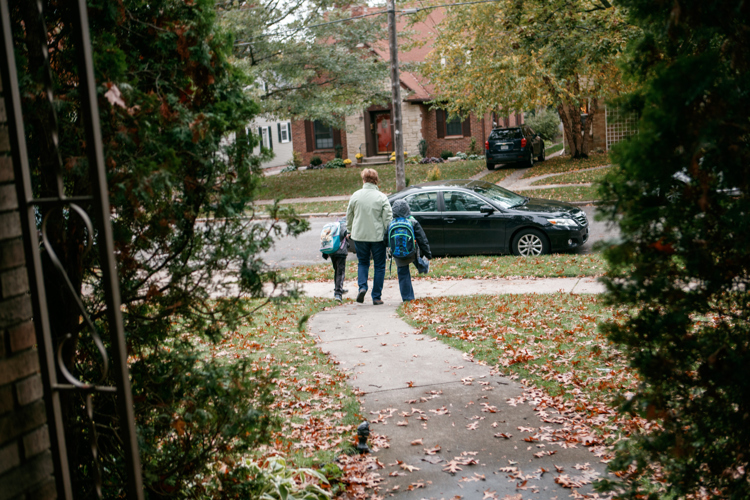 Instead of opting for school of choice, this fall, five families in the Alger Heights/Garfield Park neighborhoods took a bold step: they organized and committed to sending their kindergarteners to their under-performing neighborhood school, Brookside Elementary. Three years ago, Meryl Herr walked her toddler around the Alger Heights neighborhood with her mind full of questions. She was finishing a Ph.D. in educational studies at Trinity International University and was not only considering issues such as adult learning theory, but also more intimate, local issues: what she describes as "deeply personal questions about my family's educational commitments and our connection to our neighborhood school." Even though her child was several years from kindergarten, Herr was already receiving opinions about Brookside Elementary, the school for Alger Heights and South Garfield Park. "When we moved into the neighborhood, Grand Rapids Public Schools (GRPS) had a very negative stigma," she explains. A local teacher told her family not to send their child to Brookside, and she knew several friends who had chosen to homeschool or send their children to private schools. But her family was committed to sending their child to a public school, if possible. They wondered if perhaps schools-of-choice would provide them an option for doing so. "I watched my neighbors shuttle their children across town to schools in Kentwood and Forest Hills, and the thought of spending so much of my day in the car disheartened me," she continues. She began wondering if we could get a critical mass of families to commit to Brookside. At a block party, she asked neighbors where they sent their kids. Some of the long-time residents had actually gone to Brookside in their youth, and others remembered sending their children there. Yet no one seemed to advocate sending their child there now. Herr didn't have the time and energy to lead the effort, so she turned to prayer. "I sensed that I wanted to be involved in making our neighborhood school better, but I didn’t want to do it alone." Fast forward to winter 2016, the year before her child would enter kindergarten. Herr, now a mother of two, toured several GRPS theme schools and found they were not ideal fits for her child. It was then that her family became convinced "that we needed to turn our attention to Brookside." Then, her prayer was answered. A neighbor whom she had met at our block party sent Herr a message, saying that she knew Herr was passionate about equity in education and that she knew four other families interested in sending their children to Brookside. "Within a matter of days, four moms and I sat in my living room, sharing brownies and talking about Brookside and our motives for engaging in our neighborhood school," she says. Three of the moms had already visited Brookside and met with the principal, and after doing so herself, Herr felt convinced that Brookside was the place for her family. After the living room meeting, the group of five posted their decision on a neighborhood Facebook page. They were showered with 'likes' and comments in support of their decision. School of choice is gaining popularity in Michigan: in 2016, MLive reported that 26 percent of Michigan students are enrolled outside of their home school district. 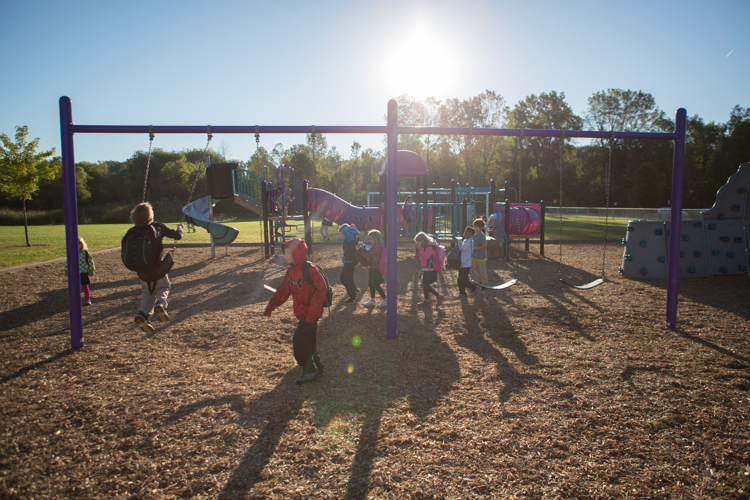 Before choosing Brookside, Herr was like many parents within Kent Intermediate School District's (ISD) school of choice system or choice systems all over Michigan: she was shopping around for a possible school that presented an ideal fit for her child. In order to secure a seat at any school outside of her neighborhood, she would need to complete an application. If the school she applied to received more applications than seats available, a lottery would be held, and if her child was not selected, she would be placed on a waitlist. It’s an elaborate process that can place stress on families, and some argue, schools. In 2016, an MLive story quoted Kent ISD Superintendent Ron Caniff about the effects of school of choice on West Michigan. “I am not convinced that the evidence is there to demonstrate that choice has uplifted all schools as it was intended,” he said. “Rather, it has decimated some districts and destabilized schools." Parents all over Michigan can turn to mischooldata.org for detailed information about public schools and the site reports that at Brookside, just 18.2 percent students are proficient in English Language Arts at the end of third grade, and according Michigan Accountability Scorecard, which rates student attendance as well as proficiency in core subjects, Brookside is rated yellow, or 71.4 percent. 85.5 percent of Brookside’s students were economically disadvantaged as of 2016. A GRPS official shared the following demographics for Brookside for the 2016-2017 year: 32 percent of the students are English Language Learners (ELL), 58 percent are African American, 27 percent Hispanic, 1 percent Asian, 6 percent two or more races, and 7 percent white. GRPS Executive Director of Communications and External Affairs John Helmholdt explains that high ELL enrollment has been driven by two factors: first, Brookside attracts ELL from outside the Brookside attendance area because it is one of 18 designated “Cultural Centers” with highly qualified bilingual teachers providing support and services. Also, Brookside is a "buddy school" to Southwest Community Campus (SWCC). 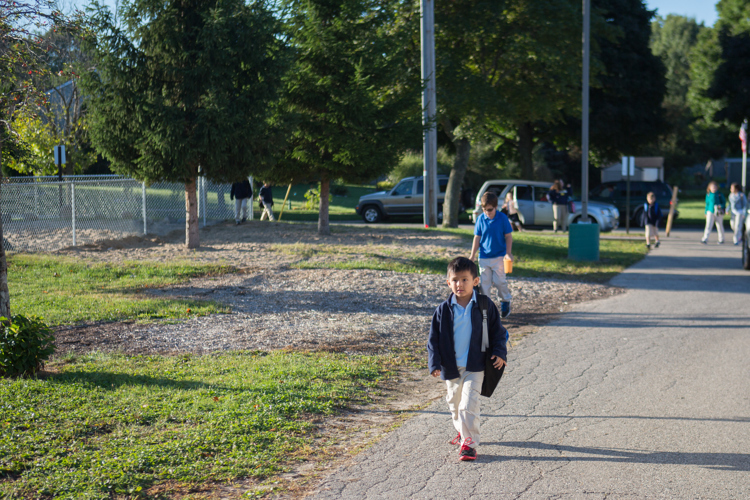 Since SWCC has a specialty dual immersion theme, if students are not bilingual by the second grade, they may not have SWCC as a neighborhood option and need to travel to Brookside. Brookfield identifies one of the key components to critical thinking: "identifying and challenging assumptions." He continues, "Trying to identify the assumptions that underlie the ideas, beliefs, values, and actions that we (and others) take for granted is central to critical thinking." As Herr applied Brookfield's ideas directly to her search for a school, she uncovered questions: "What assumptions had I made about Brookside? On what information had I based those assumptions? The opinions of others? Hearsay? Test scores?" Annie House, a registered dietitian and mom of one, found that neighbors played a huge role in challenging her assumptions. She grew up near Brookside and recalls playing on the playground at Brookside while never thinking much about why she didn't go to school there. Her perception continued when her family moved back to the neighborhood several years ago. "We'd never really considered our neighborhood public school as an option....we just assumed we would enroll our daughter into a private or charter school. 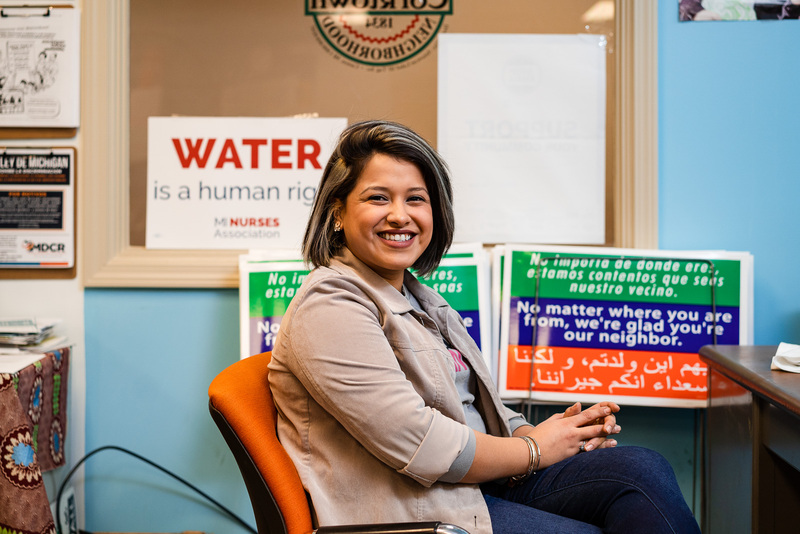 There were other areas surrounding Grand Rapids that had high performing schools but many of them lacked the diversity that we felt essential for our multiracial family," she says. While House had been impressed with a tour of a nearby private Christian school with a great reputation, her perspective was challenged when family had begun to get close to neighbors through weekly dinners. "When neighbors started asking questions about Brookside, I realized how little I actually knew about the school. We started wondering if it might be a realistic option." One key to shifting House's perception was that she would not be alone: four neighbors were getting ready to send their kids to kindergarten. "If we worked to support each other, the school didn't feel intimidating anymore," she says. "The more we talked about it, prayed about it, [and] read about how to support neighborhood schools, the more it started feeling like we'd been placed in a situation where we had a unique opportunity to be a part of something really special—it didn't feel like a sacrifice." Amanda Van Essendelft, mom of two, registered nurse, and another parent who attended the living room meeting, had lived in Garfield Park for seven years before she began to get curious. "Our good friends started talking about sending their son to Brookside for kindergarten and it got us thinking about the school as an option," she says. "I did wonder, 'is the school as bad as everyone says it is?' This was put to rest by just visiting the school in person and meeting the staff and students." Like many parents, Van Essendelft looked into the school's online ratings and reviews, but found the information "extremely limited." 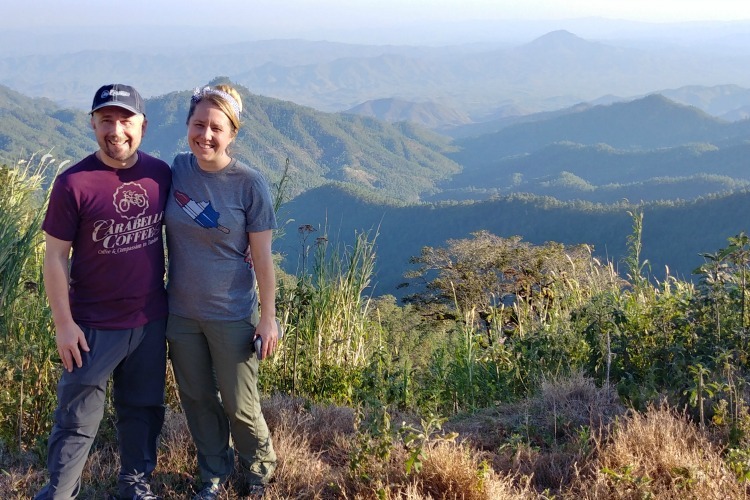 Ultimately the information she received from visiting the school itself and meeting with the principal and teachers was what pushed her to send her child there. “The personal connection and ability to ask questions face-to-face put us at ease far more than the few outdated facts available online," she explains. In order to gain more insight on Brookside and GRPS, one of the parents, Trina Rookus, stay-at-home mom and mother of three, reached out another neighbor, Barbara Lubic, a professor in the College of Education at Grand Valley State University. 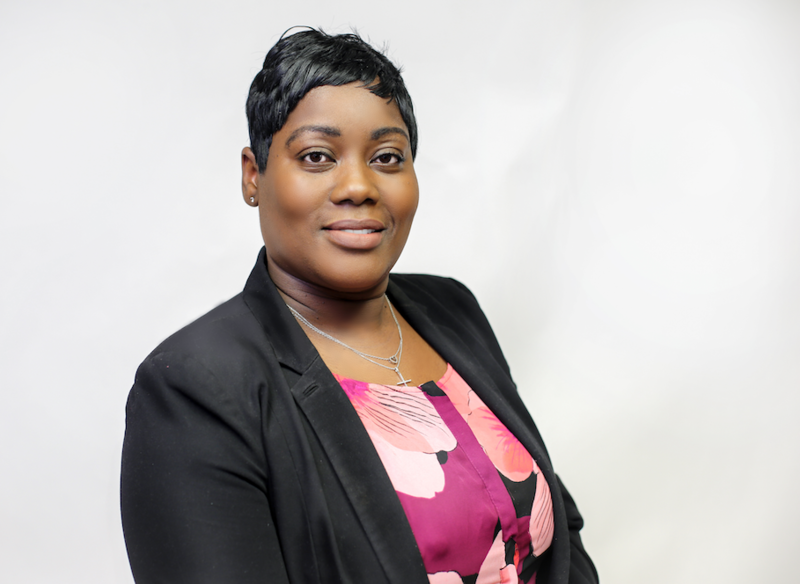 Rookus knew that Lubic understood GRPS, as well as best practices in education, and would be able to guide her in terms of what to look for beyond test scores, including the environment of the school and community connections that had been established. Barbara Lubic walks with her sons Alexander and Harold to classes.Lubic helped guide the group to formulate questions, meeting with the principal, and taking the tour of the school. "I was basically their cheerleader!" she says. Van Essendelft describes the process of touring the school as highly positive: "We met with the principal, who welcomed a meeting and encouraged us to visit in the kindergarten class. The principal answered all of our questions, the teacher was great, and her students were engaged. Visits to the website gave us basic information on test scores and such but talking with the principal told us the story behind the statistics." Van Essendelft and other parents are quick to point out that while websites report low test scores at Brookside, they don't report the high number of English Language Learners enrolled in the school, who impact test scores as they master the language. As a resident of Alger Heights for more than thirteen years, Lubic has insight into the character of the neighborhood. "I LOVE my neighborhood. It is full of families who are active in the community and support one another. When you walk down the street, you see people out, walking, riding bikes, sitting in their yards talking with neighbors. "I think the one unfortunate thing about our neighborhood is that, to my knowledge, until this year, not one family sent their children to the neighborhood school," she continues. "We all drive out of the neighborhood to Christian schools, charter schools, or other districts for public schools of choice." "For a neighborhood full of people who are so invested in their community, why aren't we invested in our neighborhood schools?" she asks. "I am not sure anyone truly ever checked out the schools. I think many families simply went with the assumption that the schools were less than adequate." As their children approached their kindergarten year, the parents shared their strong commitment to diversity and how happy they were that their children would share classroom with children from different walks of life. "Sending our daughter to a school where there was a lot of diversity was always a high priority for us," explains House. "We believe that social intelligence is vital to success, and a major part of social intelligence is learning to respect and interact with people who are different from us," Herr says. "Brookside is a cultural center with students of many races, ethnicities, and cultures. This diversity should be celebrated and nurtured." They also expressed excitement in becoming more rooted in their community and pointed to an unspoken divide within the neighborhood. "Families in our neighborhood come together at community events like Alger Heights Days or Story Time in the Park," Herr says. "We see each other at the Kroc Center or Ken’s Market. But rarely do we have families viewing our neighborhood schools as a place of community interaction and engagement." Although the parents enter the school with the energy and resources to volunteer in different capacities, they are careful to respect the existing school culture. "I'm new to being the parent of a school-aged child and I want to take time to get to know the school and the school system first," Van Essendelft says. "I think it's important to listen first and learn about a place and people before taking action. Jumping in with what I think is best for the school might not be best at all and might actually be harmful if I don't take the time to listen and learn beforehand." While the parents are focused on supporting their own child's school experience, they also place high value on the well-being of the larger school community. "I’m expressing comments and concerns to teachers, staff, and administrators when appropriate. I’m advocating for my child and hopefully for all children. We want the school to know that we are there for them!" says Herr. Van Essendelft echoes this concern: "I want my child and all the children there to receive a quality education and for the teachers and staff to feel supported," she says. And though they are only a few weeks into school and are facing the same stresses as any family would as they transition into kindergarten, their reactions are overwhelmingly positive. "I couldn't be happier. The teachers and staff and principal are incredible,” says Van Essendelft. “My daughter loves going to school and she is thriving there." "We have an enormous amount of support from our friends and neighbors,” says House. “We walk to school with each other, drop off or pick up each others kids from school (great when you're working parents), and our kids had the comfort of knowing people in their class on their very first day." 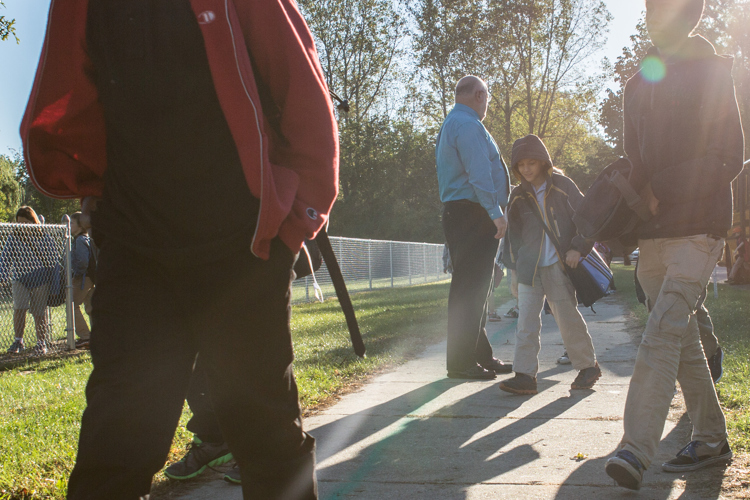 “My child is learning to write, count, and play games in gym class—perhaps like every other kindergartner in Grand Rapids" says Herr. It's uncertain what type of effect or larger movement might result from the decision of these five families. Beginning last summer, Herr started advocating more broadly for neighborhood school involvement. At Story Time in the Park in Garfield Park, she set up a table with flyers and information about Brookside because she wanted other neighborhood families to see Brookside as a viable choice for their children. 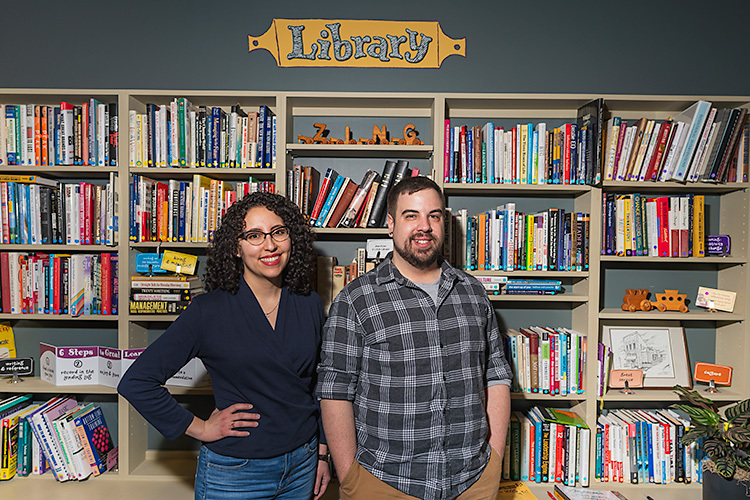 As a professor of education and long-time observer the school of choice model in Grand Rapids, Lubic hopes change comes sooner, rather than later. "If the families in the neighborhood don't invest in their school, they will struggle to survive, let alone thrive. Families can no longer drive out of their neighborhoods and abandon their neighborhood schools if we want cities to grow and thrive. If we want to attract young professionals and families to our city, we need to invest in our city schools and make them strong."